For other uses, see Dolman (disambiguation). 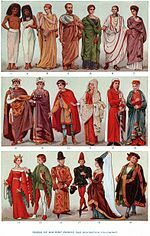 A Dolman (from Turkish dolaman "robe" ) is a somewhat vague term for various types of clothing, all of which have sleeves and cover the top part of the body, and sometimes more. Originally, the term referred to a long and loose garment with narrow sleeves and an opening in the front. It was worn generally by the Turks, and is not unlike a cassock in shape. The name "dolman" was also given to the short uniform jacket worn by hussars. The close fitting, short-cut coat was heavily braided. It was usually worn under a pelisse, a similar coat but with fur trimming, most often worn slung over the left shoulder with the sleeves hanging loose. A dolman is also an outer garment worn by ladies, with wide cape like arrangements instead of sleeves. It was a favourite style of mantle worn by fashionable women in the 1870s and 80's. A dolman sleeve is a sleeve set into a very low armscye; in fact, the armscye may extend to the waistline, in which case there will be no underarm seam in the blouse. Dolman sleeves were very popular in ladies clothing during the US Civil War. They had the effect of making the shoulders look sloped therefore minimizing the appearance of the waist. The early 21st century dolman sleeve describes a sleeve cut as one with the bodice, which can taper to the wrist or be cut widely. ^ One or more of the preceding sentences incorporates text from a publication now in the public domain: Chisholm, Hugh, ed. (1911). "Dolman" . Encyclopædia Britannica. 8 (11th ed.). Cambridge University Press. p. 392. This page was last edited on 20 March 2019, at 09:30 (UTC).